One of my best friends, Mikey, went to the Leafs-Canucks game on Saturday night and his creativity landed him in the Vancouver Province. I find the "T.O. = B.O." sign to be particuarly charming. His girlfriend is front and centre in the first one, proudly sporting the Blue & White. Nice work, Mikey! 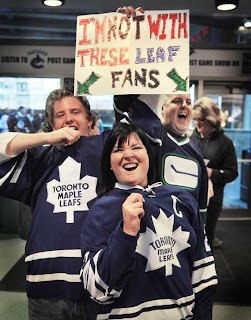 I will be praying that the Leafs exact revenge the next time the two teams meet. Hey, at least Luongo didn't get another shutout! Posted by The Renegade Librarian at 1:11 p.m.
that is awesome. just dynamite. I love it,Mikey is so funny. Great pics. 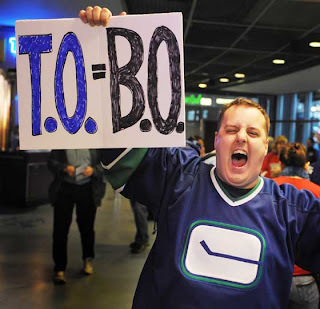 The nucks beating the leafs was awesome.